Purchase advance tickets for this event using Paypal or your major credit card. Be sure to select the ticket quantity as well as the appropriate ticket type (Member or Nonmember). Note: If you require multiple ticket types (ie: 1 member + 1 nonmember ticket), please add one type to the cart, return to the page, and add the second type separately. Guy Davis once said: “I like antiques and old things, old places, that still have he dust of those who’ve gone before us lying upon them.” Blowing that dust off just enough to see its beauty is something Guy Davis has excelled at for more than 20 years of songwriting and performing. It’s no wonder his reverence for the blues masters who’ve gone before him has been evident in every album he’s ever recorded or concert he’s given. 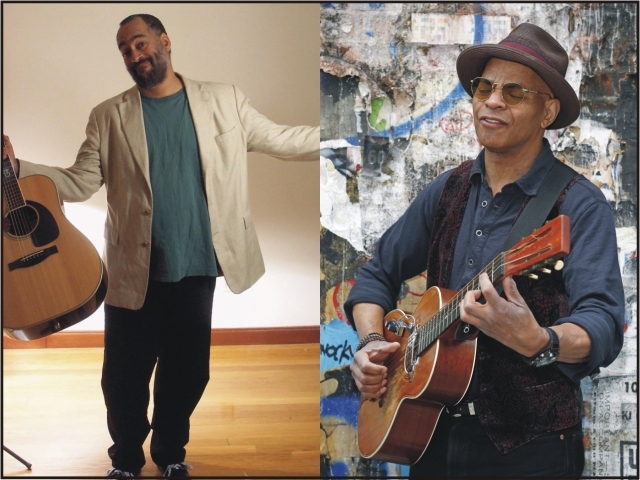 Davis’s musical storytelling has been influenced by artists like Blind Willie McTell and Big Bill Broonzy, while his musicality draws inspiration from such artists as Lightnin’ Hopkins, Babatunde Olatunji and Sonny Terry (to whom he pays homage on his album, Sonny & Brownie’s Last Train). The son of Ossie Davis and Ruby Dee, Guy Davis has spent his musical life carrying his message of the blues around the world — from the Equator to the Arctic Circle — earning him the title “A Ambassador of the Blues. His work as an actor, author, and music teacher earmark him as a renaissance man of the blues. Guy Davis previously graced the FMSH stage in 2006, and we are pleased to welcome him back. With his engaging personality, wonderful biting wit, soulful and resonant tenor voice, and solid songwriting and performance skills, Vance Gilbert has been impressing audiences since emerging on the Northeast singer-songwriter scene during the early 1990s. A former multicultural arts teacher and jazz singer from the Philadelphia suburbs, he began playing open mics in the Boston area and soon attracted the attention of singer-songwriter Shawn Colvin. She invited him to be a special guest on a 1992 tour in support of her Fat City album. Gilbert has since released many albums of his own, toured extensively, and opened tours for the late comedian George Carlin. His songwriting and performance clinics at the Falcon Ridge Folk Festival, Northeast Regional Folk Alliance (NERFA) conferences, and the Rocky Mountain Song School have drawn rave reviews from attendees – as have his previous performances for FMSH and as a co-headliner during the 2010 Huntington Folk Festival.